Do you see it? It’s right there on the horizon, next to the morning sun. It’s a chance and a choice. An opportunity to make this a great day. After all: "This is the day the Lord has made. We will rejoice and be glad in it." But what of those days when the traffic snarls, airports close, and friends forget? Despite the hang-ups and bang-ups of life, every day is filled with the hope of a God-given purpose and promise. 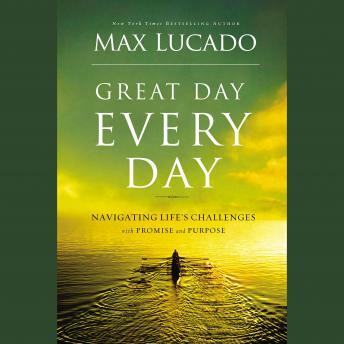 In Great Day Every Day Max Lucado unpacks Jesus’ blueprint for upgrading each of your days to blue ribbon status: saturate your day in Jesus' grace; entrust your day to His oversight; accept His direction. Grace. Oversight. Direction. G-O-D. The perfect prescription to fill your day with divine power and peace and make it a great day every day. This new title from Max Lucado has been previously published as Every Day Deserves a Chance. Great book! I struggled a little with the narrator because he sounded so sappy but the content was excellent!! Great words of encouragement. Every day God has new mercies for us to overcome worry stress need and fear.